We know it’s all about the wedding dress. But once your dream dress is sorted, it becomes all about the shoes, veil and jewellery! Whether you’re going for old-school glamour – think strings of pearls – or a modern headpiece, we’re sure to stock the bridal accessories you need to complete your outfit. From bejewelled shoes to a silver-sequinned waist-cinching belt, we’ll help you match your dress to the all-important accessories. Based in Geelong, we are an appointment-only shop, so you can rest assured you will be able to browse our range exclusively and with attentive service. We’ve matched deb dresses with gloves and jewellery, specific hairstyles with the right headpieces, dresses with veils. We stock ready-made wedding veils and bridal headpieces and also offer a custom-made service for these pieces. We stock exquisite jewellery and headpieces by Chrystalini, and Stephanie Browne jewellery, shoes and bags. Weddings today are diverse and unique – it’s all about embracing your individual style, starting your own traditions and creating a dream wedding that suits the personality of you and your groom. Some women like to wear the long-flowing veil, some prefer a short and preppy veil, some want to be a princess for a day and wear a tiara, while others want a simple headpiece to add interest to their chosen hairstyle. We also provide dress alterations in Geelong, so you can get the complete look just right. 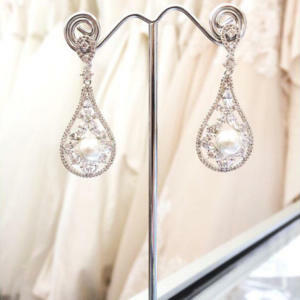 Contact us to make an appointment to browse our bridal accessories.